Are You Up for the $100 Baseball Rookie Card Challenge? If you were given $100 and could only spend it on baseball rookie cards, which ones would have the best chance of earning a return on your investment? Gone are the days when baseball cards outperformed the stock market from a percentage standpoint. However, there are still plenty of opportunities to make a few bucks flipping cards. Not flipping cards against a wall like your dad or grandpa did when they were kids, but flipping baseball cards for profit. The licensing arm of the league, Major League Baseball Properties, and the player's association, MLBPA, have tried to simplify the rules of what defines a rookie card. Unfortunately for fans and collectors, it has become even more convoluted. The Topps Company currently produces cards of minor league prospects, often in their MLB uniforms. The problem is that, often times, these prospect cards end up being worth more money than a player's legitimate rookie card. To get an "official" rookie card designation, a player has to first serve a day on an MLB roster. After a player has done this, their cards can have the official "RC" logo printed on their card and be designated as such. So to answer the question regarding the rookie card challenge, we must first define a few rules. What cards are eligible? For this challenge, only players making their cardboard debut after 2005 have an officially designated rookie card bearing the "RC" logo. With these guidelines, we are looking for cards that reflect the penny stock market and are going to earn a large percentage return. The reason being, as stated earlier, often times, a player's most valuable card isn't his rookie card but his first officially licensed prospect card from sets like Bowman. It's confusing at first, I know. Typically, power hitters and strikeout pitchers are the players most likely to see a return on investment. No two players better define that than Stephen Strasburg and Bryce Harper, future teammates for the Washington Nationals. The hype surrounding these two has been so astronomical that it has captured the attention of the mainstream media. The Nationals play in a tough division. But with a core group of young talent, they are being groomed to win in the long-term. Consequently, cards from those young players are the ones to watch. 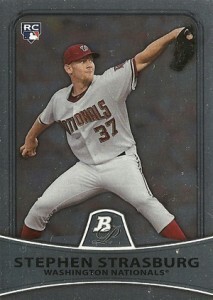 Stephen Strasburg's rookie cards can be found in 2010 products. Because Bryce Harper still hasn't made the Nationals' roster, he doesn't have an official rookie card yet. So if you had $100 to spend on newer baseball rookie cards, which ones would you buy? Would you go with lots from one player or diversify and invest in several players? Jason Heyward RC. He had a crappy season because of an injury, but will probably bounce back this year. Plus, he has the tools to be the next Griffey. Going strictly by the new guidelines of what’s considered a RC, I’m going to have to go with Craig Kimbrel’s 2011 RC’s. His stock has fallen a bit over the past month or so despite a strong performance leading up to last season’s NL ROY honors. That being said, there is no reason to think that he won’t be able to put together another strong showing for this upcoming season. I’m a Tiger fan, so I’d invest in Alex Avila, Brennan Boesch, and Jacob Turner.